It should be one the better years for mushrooms. Why? I left my old farm truck sit for 4 months under a tree and when I went to start the old Dodge I found a morel mushroom growing under the windshield wiper. I have found them in some strange places but that beats them all. We have had plenty of rain and the heat is on. Good luck getting your fill of those golden goodies this should be a great year. After working everyday on all kind of projects, this coming weekend should be good time to catch crappies. Good friend Jim Derry of Astoria will be back from Wyoming when this edition hits the streets. He has a nice lake for those big slabs behind his house. Pat Sullivan and I went there last year couple of times and had a ball. It will be a busy spring but I will make time for fishing. 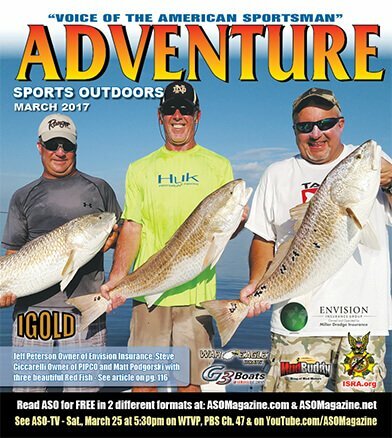 We had wonderful stay this winter in Florida fishing and enjoying the weather. We really didn’t escape the cold weather with this winter in Illinois being one of the warmest on record. I always like to put a piece about the Old Red Nose Gun Club. It was a special place where I grew up and made me the person I am today. I have put together a small profile of those special people who are all gone but not forgotten. It created memories that I will take to my grave. I shot my first duck in 1966 at a place called Duck Island farm near Banner, Illinois. It was called the Rednose Gun Club. It was a place of special meaning to me, just as important as any place where you learn to hunt and fish. It was so important that I refer to it as my Ivy League school of life. Of course I didn’t go to an Ivy League school but dad always referred to it as the place where I would learn more about life and people as if I went to Yale or Harvard. It was there I met people who were in not only the 2nd World War but the 1st World War also. He talked about getting shot three times, left for dead once, eating rats and cats for Christmas dinner in 1917. He shared how miserable it was in the trenches and letting a French prisoner of war go. After he got to know him pretty well, Paul shot in the air and told the guy to swim across the river. The guy sent him a post card from Switzerland a month later. Paul talked about hunting hares and snipe in Germany with Barons and wearing wooden shoes as a little boy in Westphalen near the Holland border. He was the company tailor, and made shoes out of German army belts for little French kids. Paul said he was not a good soldier. The stories go on and on. They were very interesting to say the least. Paul was a very good cook, as eating food was a very big part of our duck club. He taught me that no matter what cards you get in life, play your best hand. Then there was Doctor Coleman from Canton, Illinois, a world-renowned surgeon who took his internship as an army doctor on the front lines in a tent operating three days without sleep in the 1st World War. He was a gentleman and a very gracious man, who knew how to carry himself through life, was respected and admired by all who knew him. He taught me that being a gentleman throughout life was a responsibility that we all needed to attain. I remember Bill Friedman, born in 1898, he was a Marine during the 1st World War. Bill was one of the nicest, most honest men I ever knew, even to this day. Bill taught me it was best to minimize problems and successes. Earn respect don’t demand it and bragging was not an admirable trait. Then there was Dr. John Canterbury a cousin of mine and past President of the Peoria Audubon Society. He was a distinguished bone surgeon who looked at the other side of the outdoors. He talked about birds, plants and animals and showed me that life is more than shooting something, but that all things are important and relevant; knowing trivial things in life were fun and knowing to much about nothing was cool. Who could forget our pusher Frenny Courtney, he looked like an old mountain man. He was to the point when he spoke and didn’t beat around the bush. He was a poor man financially but was rich in knowing about the outdoors and making it through life on his own by hunting and fishing; an inspiration to all who think they have it bad. He lived in a reconditioned old boxcar and made it fine without government help. Frenny used to make fun of old Doc Coleman. One time Doc came down when he was in his late 80’s with his boots on the wrong feet. Frenny said, ”Doc I sure don’t want you cuttin’ on me, you look like Charlie Chaplain!” Frenny lived to be almost 100. Fred Ellis was a taxidermist, World War II veteran, hunter, fisherman and knew all there was to know about the outdoors. He taught me that you could never learn too much about hunting and fishing. I talked about him in the past, he could clean a bull head in 7 seconds. Shot a model 12 all the time, said it was the most dependable gun in the world. Fred died on the Island while hunting in 1975. There were others like Harry Trausch, the first state cop in Illinois, a Captain in World War I, who liked to have a drink of whiskey but never in his uniform. He was Grandpa’s closest friend. My Grandpa Bud, a guy who just loved to hunt ducks, died when I was 11, and is the reason I am writing this editorial. Was a true gentleman and taught me as a kid to love shooting ducks. My Great Uncle, Lee Canterbury, a cattle salesman taught me that too much whiskey is hard on your liver. He was a great guy and a hell of a pinochle player. He always had a smile and a great sense of humor. Then my Dad, Jack Canterbury, who knew that all these personalities, was an important part of learning “life”. He got me out bed at 4 a.m. and took me to a little shack in the woods along the Illinois River where old men wore khaki clothes, drank beer, played cards, cooked food, shot ducks and enjoyed life like no other place on Earth. It’s here where I learned that being at this place along the Illinois River was a place of higher learning. I found my foundation in life. I thought these men were sent from heaven just for me to learn about who I was to become and I thank each and every one of them. Even though they are gone in flesh they live on in me forever, especially my dad who took the time to expose me to the real meaning of friendship and comradely. Thanks guys, I miss you all. The Club was bought up by the State a number of years ago and finding a place like the old Rednose is next to impossible. But when the fall winds blow, the leaves start turning and the geese are flying, it’s hard not to think of those days when I was young at the old Club. A place I will always call my Ivy League college of life. McLean’s County’s Comlara Park has the bait shop open and the crappie are biting. The swimming beach opens up on Memorial Day weekend along with the pools in Peoria County and most counties in Illinois. Peoria Park District hosts their annual free Clyde West Fishing Derby Sat. May 20th @ 9:00 am – 3:00 pm. Held at Glen Oak Amphitheatre on North Prospect Road. Toss in a line and see if you can reel in one of our specially tagged fish to win a prize! Don’t have a pole? Borrow one through our “Loan a Pole” program, sponsored by the Illinois DNR. Bait, concessions, and basic fishing supplies will be available for purchase. Many thanks to sponsors for continued support of this FREE event. Contact: Steve Montez 309-681-2865. St. Joseph Catholic Church is hosting ‘Sonny Hill’ Sporting Clay Event on Sat. at (309) 347-6108. Please register online at: StJosephPekin.org. Memorial Day and every day. Keep your powder dry and your worm wet.